A Finnish fighter plane, Brewster 239 Buffalo, (hull No BW-372) was found at August 1998 in Big Kolejärvi Lake, about 50 kilometers from the town of Segezha. The last Brewster 239 Buffalo of this particular model had been found. 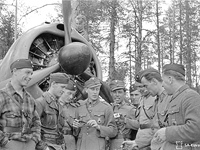 During the Winter War period Finland had purchased a consignment of 44 Brewster fighters from United States, but armistice arrived before they could be put into service. This pursuit plane got credit for being the best Finnish fighter of World War II. It was registered in The Guinness Book of World Records twice: for shooting down 477 enemy planes, an average of nearly 11 victories per Brewster, and for a single fighter (hull No BW-393) shooting down a record 41 enemy planes. Finnish renowned aces Eino Ilmari Juutilainen (94 victories per 437 air fights) and Hans Henrik Wind (75 victories per 302 air fights) engaged the enemy in Brewster fighters. 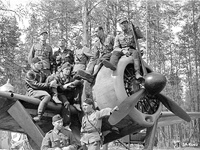 On 25th of June, 1942, a fighter (hull No BW-372) flown by lieutenant Lauri Pekuri in a group of 8 fighters of this same type, met 10 British made Soviet Hurricane fighters at Segozero lake. In the fight 7 Soviet planes were damaged. Lieutenant Pekuri shot down two Hurricane fighters (he had to his credit 18 shot down planes in total – 7 Hurricane in all) but his fighter was shot down and destroyed. He tried to land the burning BW-372 onto Big Kolejärvi lake. The fighter turned nosed over on its cowl at high speed and sank. 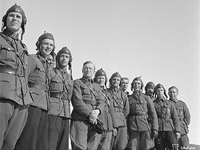 Lieutenant Pekuri succeeded in getting out from the cockpit and walked about 20 km to the battle-front, passing across a mine field to join his front-line units. Lauri Pekuri had changed over to a German Messerschmitt 109 and was taking part in the air fights until June of 1944 when his fighter was shot down again and he was in a Soviet prisoner-of-war camp for six months. In 1950 he became known as the first Finnish pilot to break the "sound barrier". Time to 3000 m: 4'12"
Time to 5000 m: 7'10"